I haven’t written for a while. It felt like I would simply be echoing other Right-leaning columnists. The Las Vegas shooting’s a tragedy. The Left says it’s the Right and the NRA. And the only way to fix it is with more violence. Nancy Sinatra (and others) thinking we should execute NRA card-carrying Conservatives. Yet, not a word by the Left of the 57 killed and almost 300 shot in Chicago this year. Not a word about a mental health issue. Only that sane, card-carrying NRA members are to blame. The climate change debate heats up, again (see what I did there?) because of hurricanes, earthquakes, rain, and more. Trump pulling out of the Paris accord will destroy us even more. Yes, yes, yes, only humans can prevent global warming. Volcanos and cows have nothing to do with it. Well, volcanos release over half a billion tons of carbon emissions a year! This week California’s governor signed, and continues to sign, even more, legislation that not only makes no sense at all but will crush the fragile state of the state even further! It seems to be a habit of government leadership on the far Left to make everything they govern worse than they found it. It’s not only a habit, it seems to be a requirement. If you challenge them they double down! Again, why? California Democrats want a free college education for all, including illegals. Free healthcare for all, including illegals. They want more taxes and, according to Governor Brown, Californians that don’t want to pay more taxes are selfish. Democrats who run this state don’t want to explain what they did with the tens of millions of dollars they took from Californians in the guise of taxes then redirected away from the projects they collected it for. And now, not only do they want Californian’s to pay again, but they also want the Federal government to bail them out. Yup, it’s everyone’s fault but theirs! And we all get to pay for it. 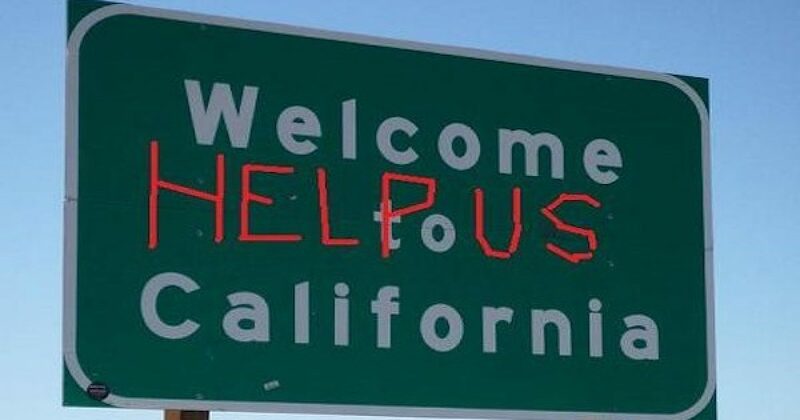 Since the Left thinks California is THE state to live in, let me help you. The state is run by Democrats. They occupy over 2/3 of the legislative seats. Republicans have only 1 constitutional state seat, meaning that governor, lieutenant governor, attorney general, insurance commissioner and more are all filled by Dems. All except one state tax commissioner seat which has now been rendered powerless after Dems voted their power away. The California Public Retirement System will receive less than 1% of its obligation through investment. The other over $100 billion will be paid by taxpayers. Depending on who you ask, there might be over $700 billion in unfunded mandates. California is ranked in the top 10 states in the worst fiscal shape. And it’s run by Democrats who want to add even more burden to the taxpayers. The Brainiac, Governor Brown actually wanted to push single-payer healthcare on the taxpayers of California. They were so excited to pass it that they didn’t actually look at the numbers. The state has a budget of about $200 billion. Single-payer healthcare would have added another $400 billion to the bottom line. Just think of it as an amusement park full of taxpayer dollars for these California legislators to blow and then blame Trump and the California taxpayer. A real-life nightmare. I say give it to them, sit back, and let them sink. Let’s not stop there. Connecticut is over $20 billion in total debt and over $102 billion in unfunded liabilities and other retirement benefits. Massachusetts, my home state, doesn’t show, over $26 billion in total debt and $190+ billion in unfunded liabilities and other retirement benefits. New Jersey has over $40 billion in total debt and more than $255 billion in unfunded pension liabilities and other retirement benefits. Illinois, the US inner city shooter capital, has over $35 billion in total debt and over $332 billion in unfunded liabilities and other retirement benefits. Hawaii has over $7 billion in total debt and almost $40 billion in unfunded liabilities and other retirement benefits. California has over $118 billion in total debt and almost $800 billion in unfunded liabilities and other retirement benefits. And let’s not forget New York, with over $58 billion in total debt and almost $350 billion in unfunded liabilities and other retirement benefits. AND the common thread in all these states is… they are all under Democrat rule! It’s just the management style of Democrats, the way they tax, the way they make laws, the way they blow your tax money, and then try to tell you how selfish you are for not letting them take advantage of you. If California is any indication of how Democrats want to rule, please stop, and stop now! The country can’t afford any more governing like this.